When events of uncaring disconnection (from fellow human beings, from history) happen—when people pull others into their pain, insecurities, and fear, as I believe is the case most of the time—the consequences turn into the greatest crises we see—terrorism, unjust laws and systematic practices, murder, genocide, everyday hatred, etc. It is hard for me to continue to believe in the “grieving process” or “human resilience.” And it makes me especially uncomfortable to hear people praise victims for their “dignity” and “grace” in handling injustice. People would not have to grieve or be resilient in these cases if we made our world better and did not waste our human potential—not our potential to build buildings or bridges or “win” a war—but our potential to treat each other humanely and with empathy and actually learn from history. But I guess a historian in a podcast I recently listened to was right—there is no such thing as learning from history. We learn the wrong things from history. But—still—I believe we can learn. 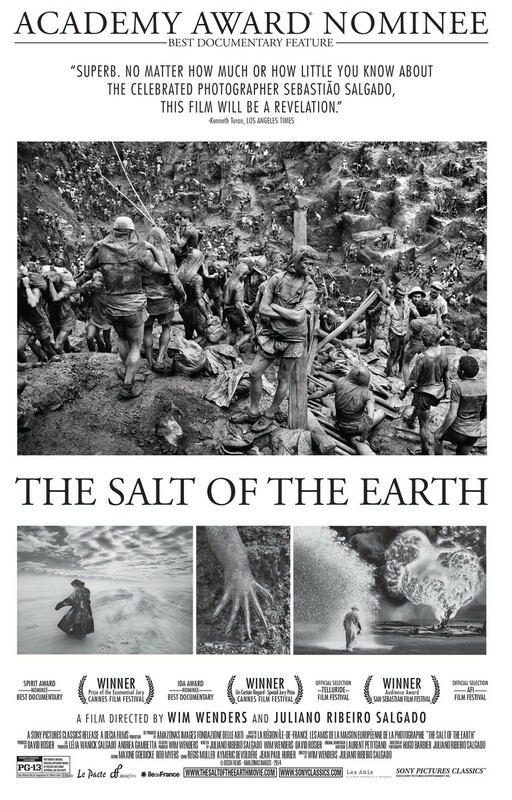 The Salt of the Earth (2014 Academy Award® nominee, Best Documentary Feature, directed by Wim Wenders and Juliano Ribeiro Salgado) shows us that that—contributing “awareness about the world we live in”—is exactly what Sebastião Salgado has always done. With his remarkable spirit as an economist turned photographer, he shows us the land, the water, and the human condition in intimate ways that should bring us closer to one another. I know it made me feel more connected. This stunning documentary reflects Salgado’s stunning life’s work.